The UK's National Institute for Health and Care Excellence (NICE) today published draft guidance that failed to recommend Celgene's cancer drug in a rare haematological condition. NICE, which provides healthcare guidance in England and Wales, said Celgene did not provide enough evidence to justify the £3,780 per month price-tag of Revlimid (lenalidomide) for use in the treatment of people with a specific type of the bone marrow disorder myelodysplastic syndrome (MDS). 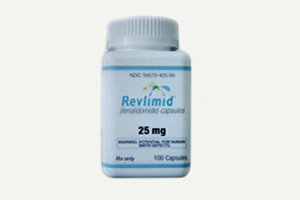 Revlimid, which made almost $3.8bn for Celgene in 2012, is already used regularly on the NHS as part of a combination with dexamethasone to treat adults with multiple myeloma. Celgene is hoping to expand the drug's reach further, however, and last month European regulators extended the drug's approval to cover patients with MDS who have transfusion-dependent anaemia and whose condition is associated with a genetic abnormality known as isolated deletion 5q. It's in this new indication that NICE deems the price of Revlimid to be too steep, despite the organisation's chief executive Sir Andrew Dillon commenting that the drug was an effective therapy for people with the condition and that its tablet form meant patients spent less time in hospital. These positives weren't enough to outweigh the organisation's concerns with Celgene's data, however. “NHS resources are limited and NICE has to decide what treatments represent best value to the patient as well as the NHS, and in this case the manufacturer did not provide enough certain evidence to justify the price they are asking the NHS to pay,” said Sir Andrew. In its statement on the draft guidance, Celgene described the decision as a “disappointment” for patients with this specific type of MDS. “This could be a real setback for patients who are eligible for this treatment, as lenalidomide is the only active treatment available for this rare, but debilitating blood cancer,” said the company's medical director Dr David Gillen. NICE's guidance is now out for consultation, giving Celgene and other stakeholders the opportunity to discuss the Institute's preliminary recommendation.